With our technology, we will guide you along your journey to improve your bone density, improve your balance and make you feel strong again without sweating, without drugs and it only takes 10 minutes, once a week. My back hurt for months and nothing worked until I came to OsteoStrong, after the first session my back felt 75% better and after the second session my pain was GONE! I’m back to bootcamp and dancing again, love this place! Why do I drive to Austin from Houston once a week? I’ve been coming for 4 months and I’m now 25% stronger in my Olympic lifting. I hit a new Personal Record every week, it’s unbelievable. I’ve been charting my gains for 3 years, and the last time I had this type of growth, it took me 18 months. I can’t wait to see where my strength levels end up after 18 months of OsteoStrong. The sessions at OsteoStrong are really working, 2 examples: 1) I was able to move a really heavy coffee table pretty easily, it wasn’t that hard! 2) I get up between 4-5am and have more energy thoughout the day than I did before and I’m on my feet all day, best of all is that it’s so convenient and I feel better! Internal medicine doctor for over 20+ years and I was skeptical. I hear about new technology all the time and I don’t recommend anything that I haven’t done myself, so I decided to try an OsteoStrong session. I had back pain for along time which was limited how much weight I could lift(competitively) and after one session my back pain went away – I was so blown away I became a member. Check it out for yourself! My back pain is going away, my stability has improved, the HydroMassage for traction is great and the BioCharger is amazing! My leg use to ache all night with sharp shooting pain to the point where I couldn’t sleep, that pain is now GONE and I can sleep! My balance is lot better and I’m not saying I’m a yoga instructor yet – but who knows! Also, my energy is better and more steady – not like a coffee energy, but a better balance of energy without the crashes. I’m spinning out of Osteostrong like a Tasmanian devil now! I took a fall, and had an injury and I realized that I needed to strengthen my bones and I wanted a solution that I felt safe about. I didn’t want to take hormones, and I like OsteoStrong because its mechanical – holistic. The most exciting thing is that I used to walk using a walking stick, and thanks OsteoStrong (Lata in particular), the walking stick is at home leaning up against the wall. Free Osteogenic Loading Session including HydroMassage and BioCharger on your 1st Visit! No obligation, come experience all we have to offer for yourself. We’ll create a plan for you and guide you through the entire journey, and you’ll love it. Seriously, check out our testimonials above – coming to OsteoStrong is the favorite part of their week! Click Here to Schedule Your First Complimentary Visit! If you are over the age of 60 and break a hip, you have a 1 in 5 chance of dying within 1 year. If you are over the age of 60 and break a hip, you have a 1 in 5 chance of dying within a year. With our advanced technology, you can begin strengthening your bones drastically reducing your chances of both falling and breaking a hip. Our studies show that we can improve bone density by 14% in as little as 6 months. We walk on flat even surfaces all day every day, sidewalks, flooring etc. This matters because our stabilizer muscles aren’t getting activated because there isn’t any variability in our walking. Why do you care? Because most hip fractures are caused by falling. Falls can be prevented by using our vibration plates. Our members have seen 100% improvement in balance in as little as 8 weeks by performing movements to recruit all of those stabilizer muscles. You will leave every session with better balance than when you came in. 60 seconds of effort per week to build incredible Strength and Endurance. We know that sounds crazy, so let us prove it to you as we have with thousands of other members. We know that we are born with X number of muscle cells, so we can’t change that but we can improve the density of the muscle cell with myofibril development. It doesn’t take 3 sets of 10 or 90 minutes every day – it only takes 60 seconds, once a week. This isn’t exercise and we aren’t doing 3 sets of 10 here. This is impact emulation, and with our 4 machines you’ll spend 60 seconds of actual effort to trigger the bone building process. Sounds crazy, we know – but we get results. Check out our Testimonials and Science down below. Enhance circulation, relax your muscles and relieve stress – it’s the ultimate massage. No one walks out of the hydromassage room, they float out on Cloud 9. Once you experience controlling the water jets, you’ll understand. It’s like having the power of the Bellagio Fountain at your fingertips – life will never be the same. The BioCharger™ is the world’s first subtle energy revitalization platform that works to optimize your health and wellness by aligning and balancing the energy of every cell in your body. When your cells are charged to optimal levels, you feel invigorated, focused, and well-rested. BioCharger™ sessions are 15 minutes or less, touch-free, and non-invasive. You can download the four studies below and bring them to your doctor to learn more. Ask them what they know about Wolff’s Law and mechanotransduction as it relates to bone, or osteogenesis. While these principles are over 100 years, these studies are cutting edge. Learn why walking, running and even weight lifting have little to no positive effect to improving bone density. Learn how Osteogenic Loading works with and without Bisphosphonates and how your body is perfectly capable of rebuilding bone tissue holistically. Proving the efficacy of osteogenic loading with a group of women over the age of 50. Learn how Osteogenic Loading lowered A1C levels by .6% in only 6 months without changing their diet. OsteoStrong sessions utilize a series of robotic musculoskeletal treatment devices that allow axial compression of bone to emulate the effect of impact, we call this Osteogenic Loading. Because of the robotic optimized positioning of the human body, loading forces go through the human bone that are far higher than those seen in daily activity or weight training. Heavy loading is already understood and recommended by all international bodies of medical education, but at OsteoStrong, we make it safer. In fact, we’ve known for over 100 years that Osteogenic Loading works. In the late 1800’s, Dr. Julius Wolff discovered that bones will adapt to the loads under which they are placed (Wolff’s Law). What we didn’t know until the 2012 Deere & Tobias study (below) was that there is a minimum threshold to triggering osteogenesis. 4.2 multiples of your body weight is the minimum required force to trigger bone growth in the hip joint (the most important place to avoid fracture) and peak forces with adults in conventional resistance exercise only show 1.26 to 1.54 multiples of body weight. Specialized tissues make up your skeletal muscles. These tissues change how they function in response to different kinds and rates of stimuli. Most physical therapy exercise is intended to improve muscle strength by increasing the gravitational load on muscles. 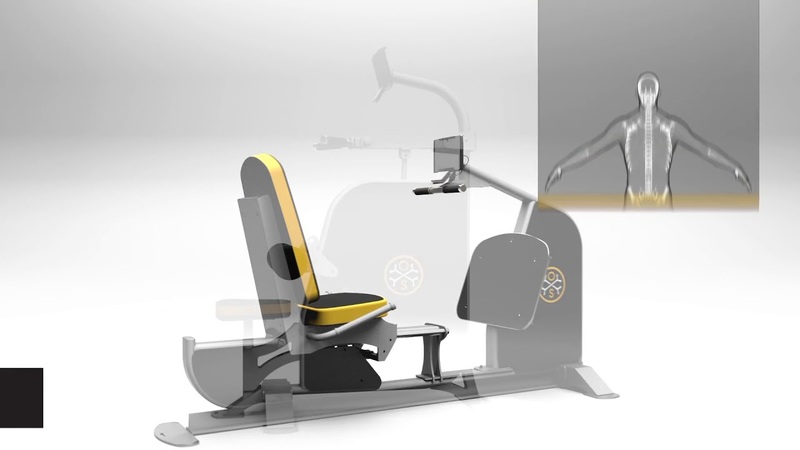 Physical therapy vibration platforms, on the other hand, impose hypergravity activity within muscles by using higher accelerations (vibrations). Whole Body Vibration produces short, quick alterations in tendon-muscle complexes, which stimulates muscle spindles and nerve cells. In turn, your muscles have a reflex reaction as they try to dampen vibratory waves. After going to over 15 Tony Robbins events, I finally understood what the next chapter was going to be about – Contribution. In November of 2017, I happened to walk by a booth at an event that had some pretty high tech equipment and I stopped by to check it out. They were telling me how it was designed to naturally improve bone density and reverse Osteoporosis. I immediately pictured my mom and thought, wow she should really use this! Then they started talking about the other benefits of Osteogenic Loading, like helping eliminate Fibromyalgia, reduce and eliminate Chronic Joint and Back pain, and also reverse Type II Diabetes. In my head, I’m thinking about my mom and saying check, check, check – I HAVE to get my mom to an OsteoStrong center. There wasn’t one in Austin, and that’s when it all fell into place, the universe had put this in my path at perfectly the right time – 6 months later I had resigned my 20+ year career in Technology and Operations and opened my first OsteoStrong. Come on in and visit our center learn more! To Whom And Where Shall We Send The Pass For A Complimentary Session?